“Caption to the original at source: Lesbian Novel, The Clever Young Women, 1927 – BUT According to Julie Nero in her PhD “Hannah Höch, Til Brugman, Lesbianism, and Weimar Culture”, https://scholar.google.co.uk/scholar?hl=en&amp;q=++++HANNAH+H%C3%96CH%2C+TIL+BRUGMAN%2C+LESBIANISM%2C+AND+WEIMAR+SEXUAL+SUBCULTURE+by+JULIE+NERO&amp;btnG=&amp;as_sdt=1%2C5&amp;as_sdtp “Otto Hahn, cover Illustration. I suggest the pose of these dancers – and indeed, their physical intimacy, is consistent with tango. 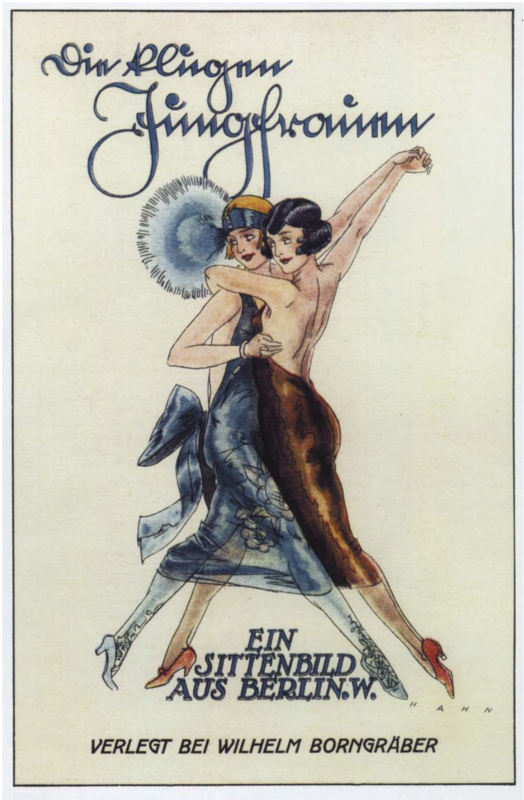 “While the sexually aggressive monocle-sporting vamp, a figure often pictured alone, was frequently featured in lesbian publications…the motif of the dancing female couple was wildly popular among Weimar lesbians and the general public alike.